These signs are 3mm thick , rigid plastic that is digitally printed using UV protected thermal ink, so they can be used both inside and outside. Promote and sustain the continuous 5S methodology throughout your work place with our most popular 5S sign set! Fabufacture has created the 5S Shopfloor Series high quality, digitally printed signs to guide employees in creating organised and manageable work areas. 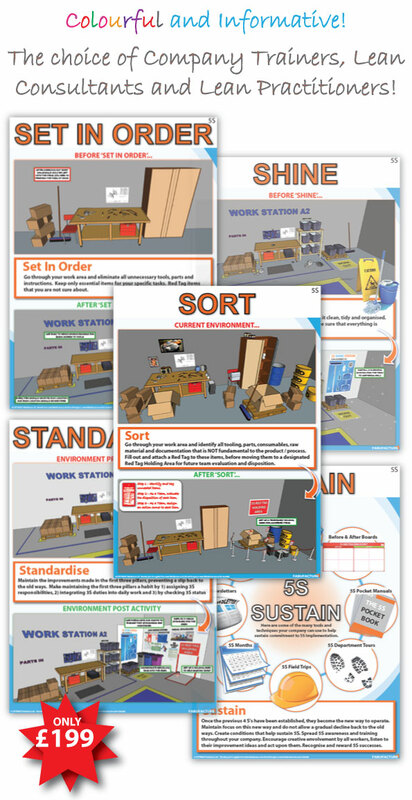 All of the signs in this set describe and visually illustrate the 5S activity being carried out. Use these colourful high definition signs to brighten up work areas and motivate employees to practice the 5S’s every day. This set is a cost-effective and valuable way to sustain the results of a 5S program. This 5s sign series is one of our most popular product choices and is favoured by in-house company Trainers, Lean Consultants and Lean Manufacturing Managers.